My son attends a LEED certified, green Montessori school and instead of celebrating Halloween they're having a pirate feast to go along with their class unit on piracy. Each child has been spending weeks studying, researching and writing about their favorite real-life pirate. 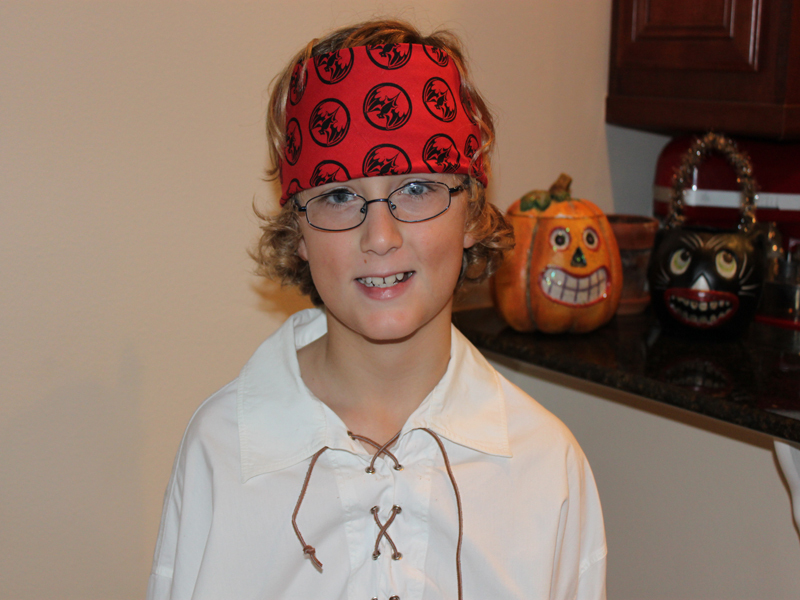 All of their hard work will culminate when they dress up as their favorite pirate and present their projects at the pirate feast on Halloween. 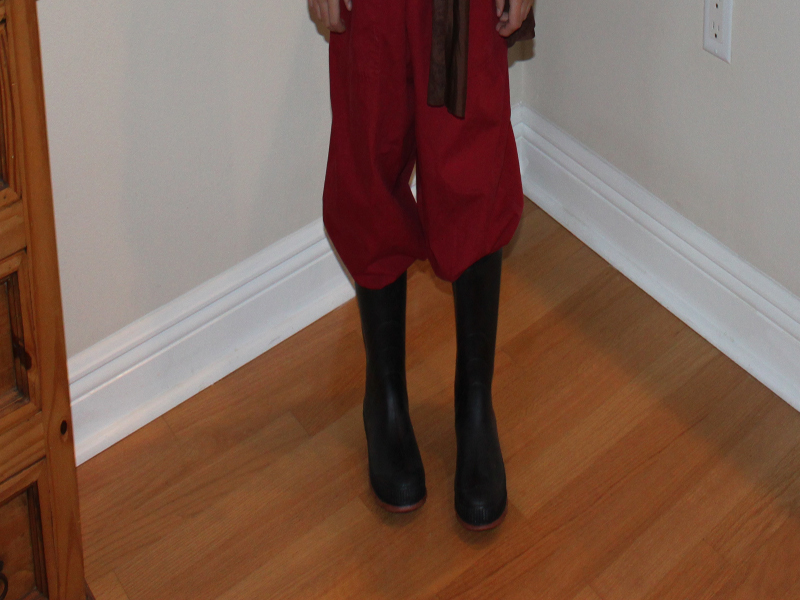 My son and I decided to create his pirate costume using only pieces that we either already had on hand or could pick up at our favorite thrift store. 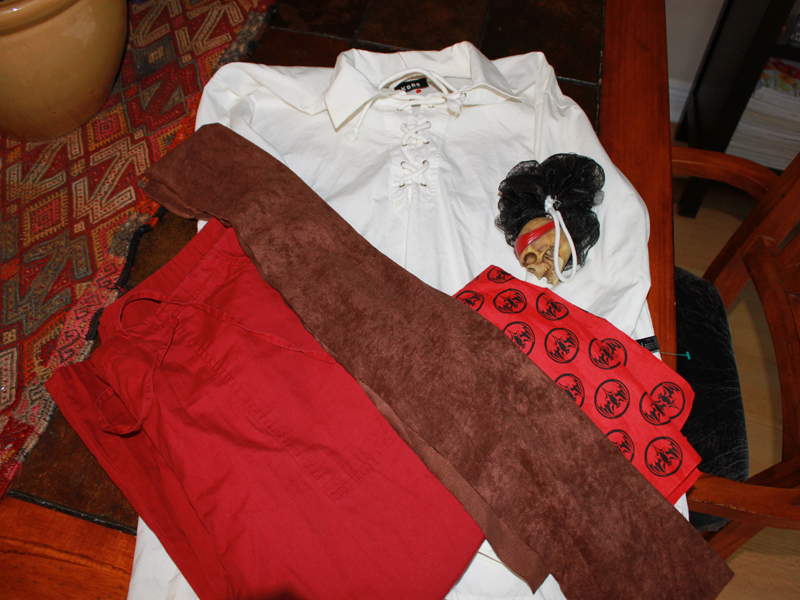 Read on to learn how we assembled this fun pirate costume for only $5! If your little one wants to be a pirate for Halloween, you can put this costume together in an afternoon for a similarly low price. <h2>For the Shirt</h2> After scouring the children's clothing at our favorite thrift store and coming up empty handed, we headed to the women's clothing. My hope was that I could find a shirt that we could alter. Somehow we completely lucked out and found a shirt that had a very pirate-y feel to it. 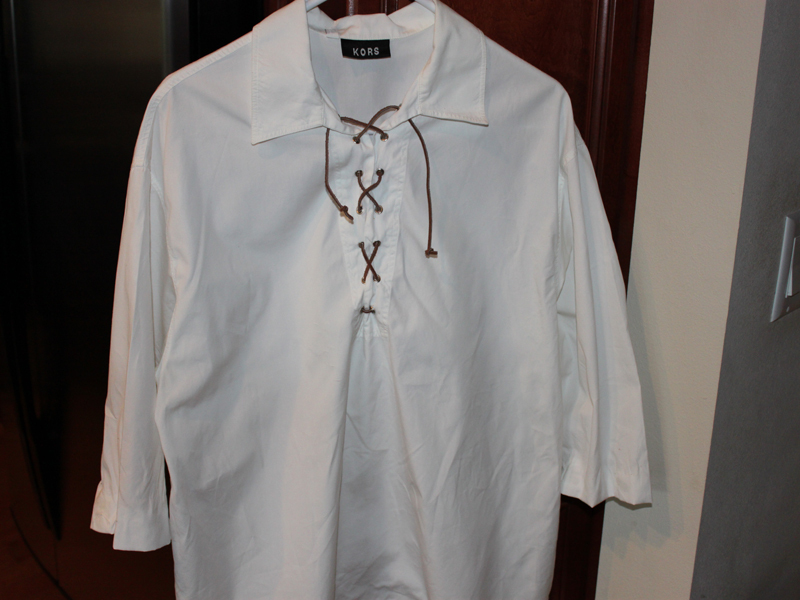 I removed the cotton cording on the front of the shirt and replaced it with a long piece of leather cording that we found in the craft closet. Then, I altered the sleeves and bottom of the shirt so it would fit my son better. I tied leftover pieces of leather cording around the fabric at his wrists, then pulled the sleeves up a bit to give it a poofy look. 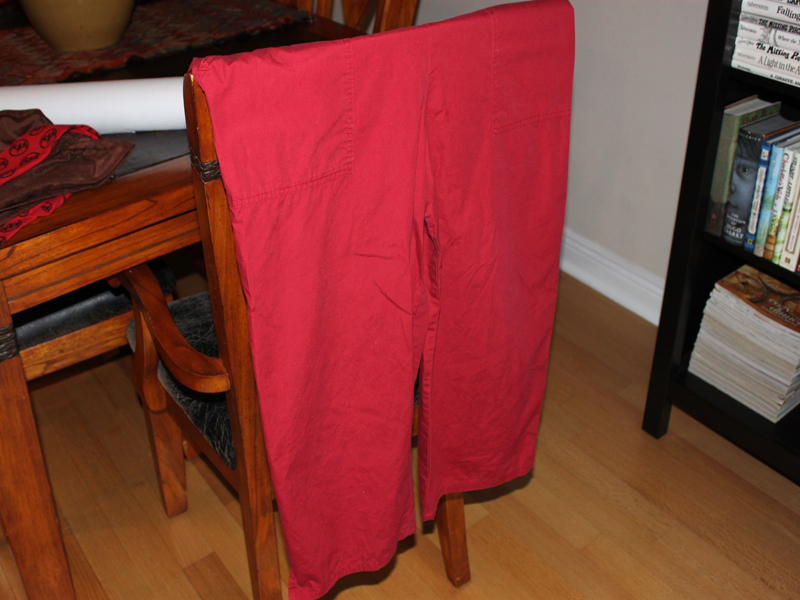 <h2>For the Pants</h2> Also at the thrift store, I found I pair of medium red capri's with a drawstring waist. By cinching the pants at the waist and tucking them into his boots, the over-sized pants naturally had a poofy pirate look. 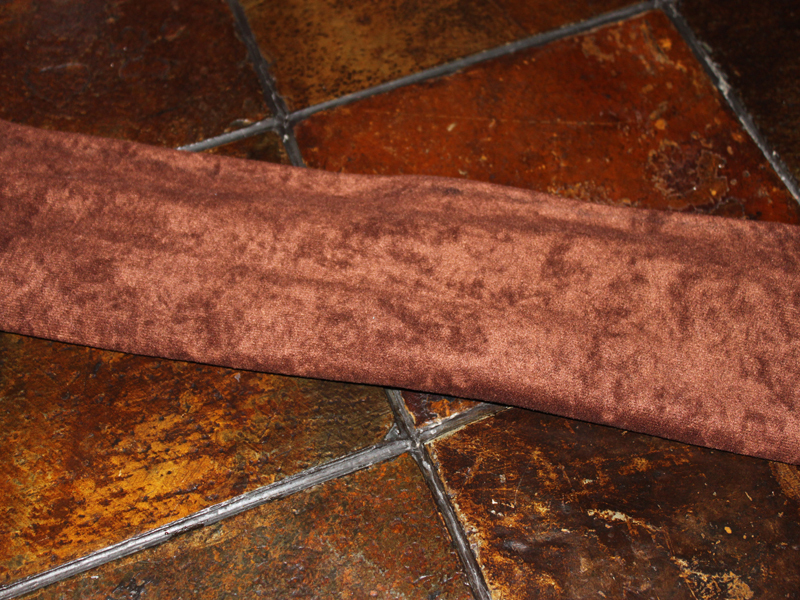 <h2>For the Belt</h2> I found a long fabric remnant in our craft closet, left over from a making a previous year's Halloween costume. I tied it around his waist, pulling the shirt up a little, adding to the poofiness. 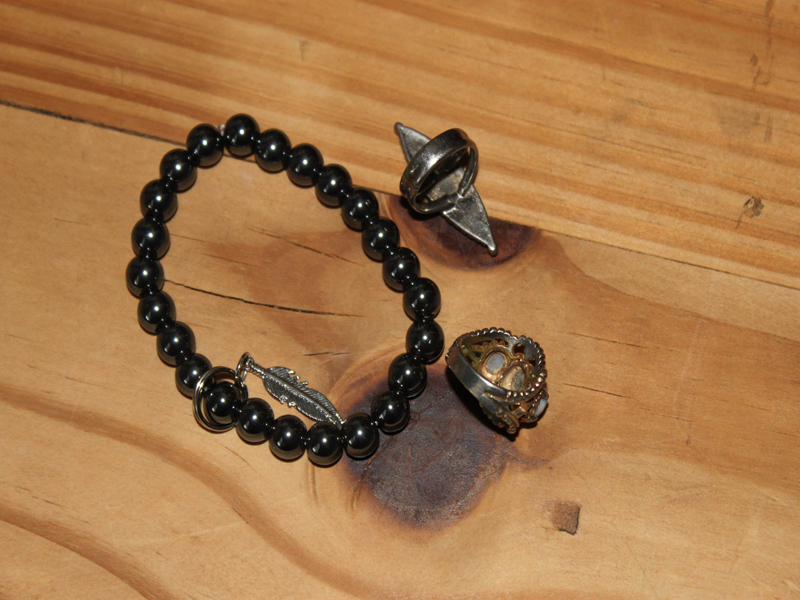 For fun we attached a pirate skull head from a weird loofah we found at the thrift store as an adornment on the belt. <h2>For the Boots</h2> My son already had a pair of black rain boots in his closet, these worked well because we could tuck the pants into the boots to adding to the poofiness factor. 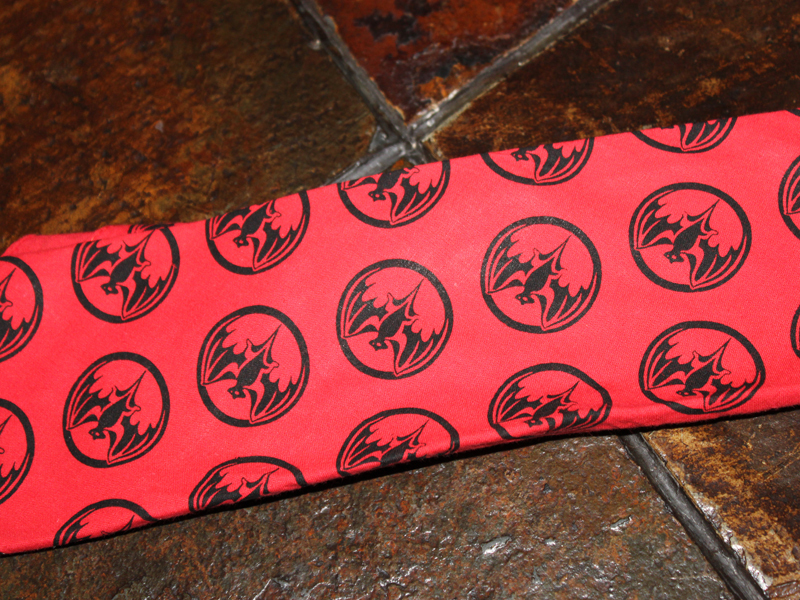 <h2>For the Bandana</h2> We found a weird bandana with bats all over it at the thrift store, it was perfect for the look we were going for. 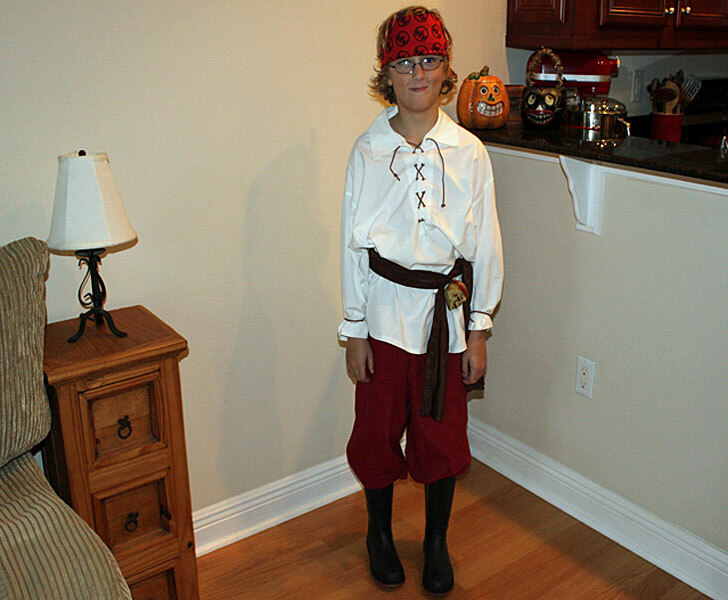 I folded it and wrapped it around my son's head for that Johnny Depp/Captain Jack Sparrow look. <h2>For the Jewelry</h2> I let my son raid my costume jewelry supply, I have a large collection that was left to me by my grandmother. We also used beads in his hair for a very pirate-y look. <h2>How it Came Together</h2> We plan to complete the look for his party by adding a small mustache to his face. Total cost = $5. Can you say Argh, Mateys?